I don't know if this was our (the Brits) fault, but Hong Kong suffers from some of the same identity crisis that the British do. That is, I live in England, Great Britain or the United Kingdom. All these names mean different things and as well as inflicting the occasional bouts of terrible violence, it tends to confuse visitors. Well, Americans usually, who can sometimes be found in a scenic spot of the Scottish highlands, nursing a broken nose and wondering why everyone got so upset when they'd said how pretty this bit of England is. It's not quite so bad in Hong Kong, but it is confusing. To clarify, Hong Kong is the name of one island � Hong Kong Island, but Hong Kong, in a wider sense is rather bigger. It includes a great archipelago of islands. Some are little more than uninhabited rocks, other are large enough to house a snappy new international airport, an eye wateringly big Buddha as well as a Disneyland (albeit a small one, I'm sure Mickey is there, but Goofy may have fallen off). Yet, Hong Kong isn't just an island, or even a lot of islands, because most of its land is a chunk of the mainland known as the New Territories. All clear? Good. Now, Hong Kong sounds like it has a lot of land, doesn't it? Well, the problem is that it's not the right sort of land. Most of Hong Kong is vertical, or near enough. It's a place of towering skyscrapers and vertiginous mountains. You just have to look at the smaller undeveloped islands to see that they're like an inverted V. Nowhere is naturally flat, just a tricky steep slope of land that gives civil engineers an awful headache. Since invading China isn't a practical option these days, new land is either plucked out of the air � in the form of high rise developments, or reclaimed from the sea. Unlike the legendary Atlantis, or poor old Venice, Hong Kong isn't sinking, but through a series of land reclamation projects, instead rises majestically out from the sea. This land reclamation process is going on all over Hong Kong. During a visit to Ocean Park � a wonderful theme park filled with pandas, roller-coasters and Mr Squid fast food stalls � we saw a bit of this going on. An industrial conveyor rolled stones and rocks from a nearby building site and spat them onto a boat. Later, these would be shipped off and dropped in the water, creating a few more inches of land for Hong Kong's cramped populace. It's hard to underestimate how much the city's geography has been transformed. Whole islands have vanished, as they're merged into one another. And it isn't a new initiative. I saw one painting of Hong Kong Island harbour from the 1850's that showed a very different coastline to what exists now. Where there was once an expanse of water, there is now a city jam-packed with high rise buildings, roads, trams, office space, shopping plazas and noodle bars. A nice way to spend a few minutes is to see the Symphony of Lights. 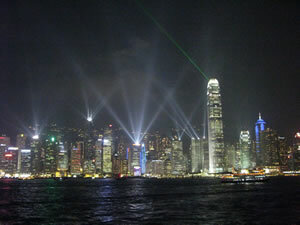 Stand on the Kowloon side of Hong Kong harbour and your eyes are filled with glitzy, feng-shui inspired glass skyscrapers of all shapes and sizes as they're lit up in a colourful display. It is a wonder to remember that everything you can see was once water. The sense of romance is only slightly marred by the dodgy soundtrack that sounds like 80's French keyboardist, Jean Michelle Jarre, on a bad day. Despite all this extra land, you are constantly reminded that there isn't an abundance of space for the seven million people living in Hong Kong. Take the old fashioned bird market in Kowloon. Amongst the boxes of live insects and old men comparing their feathery friends, are square bird cages piled high, one atop another. 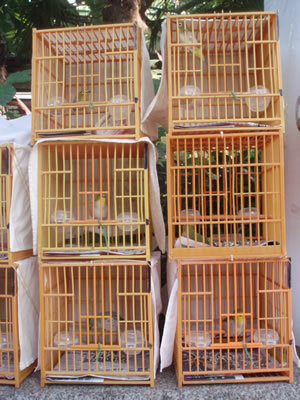 Each cage can be no more than 10 cm square and each stuffed with feathers and tweety birds. It might be considered cruel, but the fact is you look at those piles of little cages and they look just like the high rise apartment blocks that house almost every one of Hong Kong's people. But it's not so bleak. Housing developments are adept at providing communal facilities. If you've got the money, you can get a place with a shared gym, indoor and outdoor pool, a sauna and a reading room. I was lucky enough to be able to swim on a private beach each morning, beneath the sprawling Tsing Ma suspension bridge. And if you can't afford that luxury, Hong Kong is well provided with Olympic sized public swimming pools, new libraries with books that don't smell and vast leisure facilities with plenty more than just ping-pong tables.